It was so innocent looking, in its small pot, hanging out at the nursery. One little zucchini plant. I knew better than to buy two, but I was tempted. I remembered, though, making loaf after loaf of zucchini bread when my dad (briefly) had a garden that included the plant. 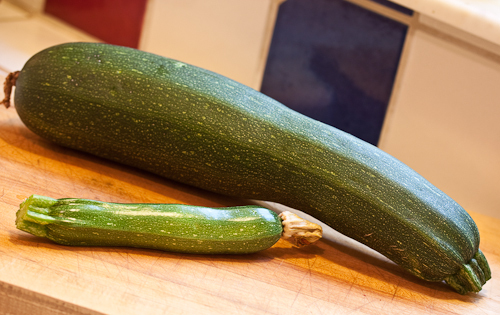 One thing about zucchini — they give back. You can wander out in the morning with your coffee, poke through the prickly leaves and see a few adorable little squashes. By evening it seems like they’ve bulked up to giants! 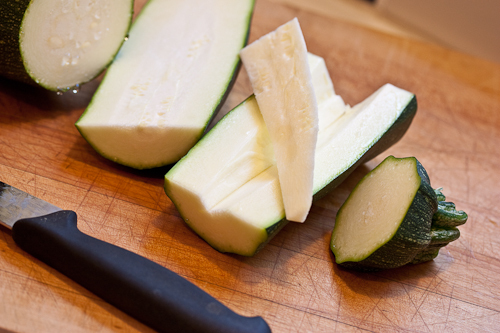 I’ve gotten out my old recipe and with a few changes and adaptations have, well, one delicious solution to zucchini invasion. One of my zucchini loaves has, in addition to walnuts, dried bing cherries in it (one member of the family doesn’t like them), but that’s optional. Raisins are nice, and pecans work well, too. So moist and delicious — try it with cream cheese! 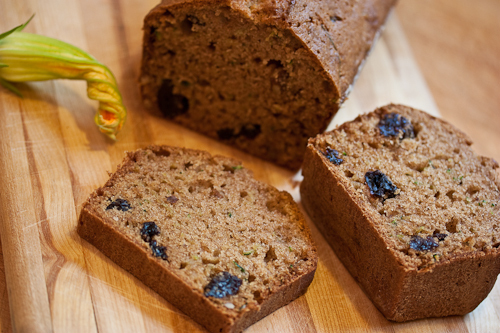 Now when you go out with your coffee to check on the garden, you can take a piece of zucchini bread with you! 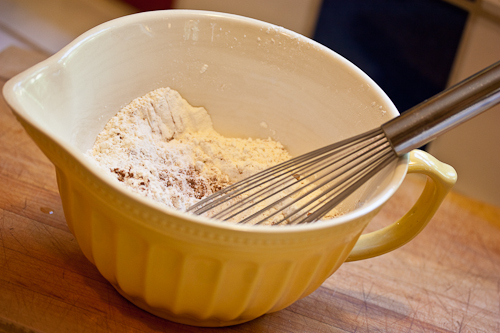 I like this recipe because you don’t even need a mixer, just a whisk. Preheat the oven to 350°F. 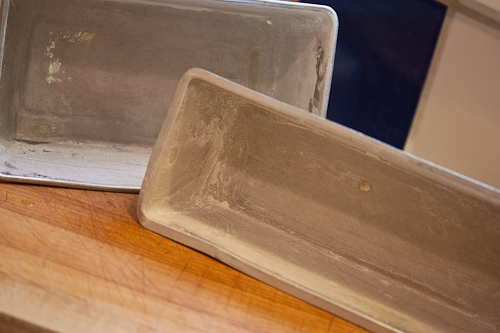 Generously butter and lightly flour 2 bread 8 1/2 x 4 1/2 bread pans (standard 1 pound loaf pans). In a bowl, whisk the eggs together, add the oil and beat until well combined. Add the sugars and vanilla and beat until well blended. 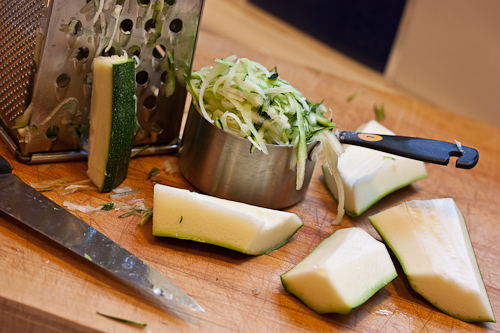 Stir in the shredded zucchini. Combine the flour, soda, baking powder, salt, cinnamon, and nutmeg in a bowl. 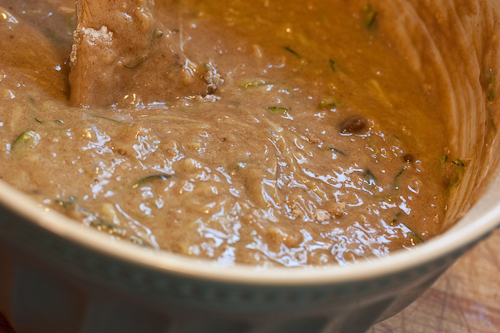 Blend together with a dry whisk or fork. 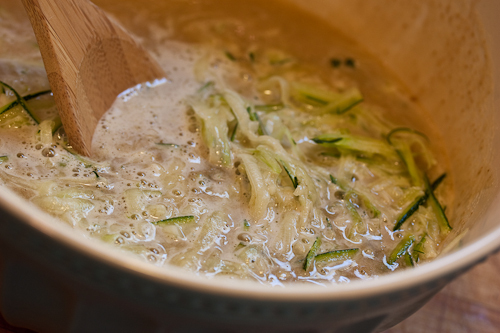 Add the dry ingredients to the egg/zucchini mixture and stir until combined. Don’t overmix. 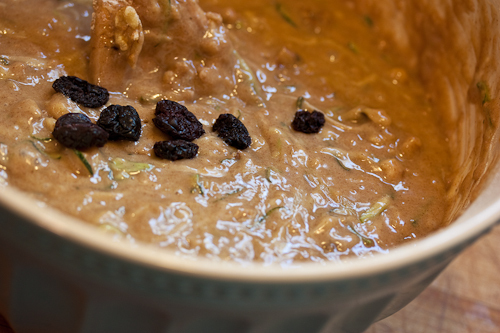 Stir in the walnuts and cherries. Divide into the two prepared loaf pans and bake in the preheated oven for 50 minutes to 1 hour, or until a skewer inserted in the middle comes out clean. Cool on racks and serve warm or room temperature.